Every type of exercise bike has its own set of benefits, while each serves its own purpose and helps one get in shape nonetheless. Recumbent exercise bikes are the perfect indoor exercise machine for those people who look for comfort even when they work out. They are equipped with chair-like seat that offers great support for the back and gives a reclined position that puts absolutely no strain on it. An added comfort is that when using the recumbent exercise bike your hands are completely free, which means you can read a book, or play games even. Yes, a recumbent exercise bike is a bit more laid back than an upright one and won’t count as cardio but it is known to help burn the same amount of calories. They are a good alternative for those people who love to work out but have back problems; as they don’t put strain on the back. Recumbent bikes due to their design prevent one from pain in the rear, literally; and according to experts don’t give muscle soreness at the same time the following day. Not to mention, they are much safer than an upright one, as recumbent exercise bikes come with a larger seat, back support and has a lower height. They are extremely useful for providing cardiovascular training to patients and people with impaired mobility. 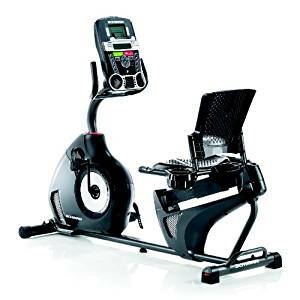 What Features To Look For When Buying A Recumbent Exercise Bike? Various recumbent bikes such as the Schwinn 270 Recumbent Bike have a data tracker that helps one keep track of your routine and shows your fitness progress. All data such as time spent working out, distance done etc are all recorded and displayed to the user. Make sure the seats to the recumbent exercise are adjustable, this way you can place the seat according to your height. Resistance is the key when it comes to recumbent bikes, with resistance adjustment you can challenge yourself further and achieve new workout goals. It is necessary that the recumbent bike you are purchasing should come equipped with a warranty that covers all parts and electronics. Fitness requires complete dedication, especially if you’re one of those people who like working out from home. Exercise bikes, be at the gym or at home are the perfect way of keeping fit and recumbent exercise bikes are the perfect blend of fitness and comfort due to their low adjustable seats. The NS-716R Marcy Magnetic Recumbent Exercise Bike with adjustable length and 8 resistance levels is the perfect solution for getting your cardiovascular exercise done. Recumbent bikes are best known for their comfort, as they put less strain on your back, knees and neck. 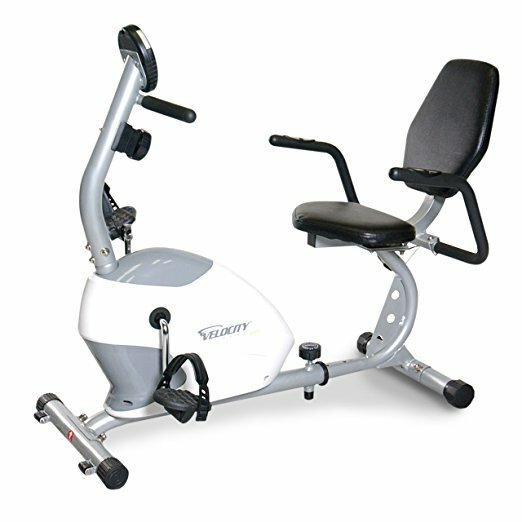 The Marcy Magnetic Recumbent Exercise Bike NS-716R is fully adjustable and can accommodate a wide range of users. The seat can be adjusted according to the needs of the user in order to accommodate the legs at a comfortable length for a longer period of time. The resistance of the bike can also be adjusted up to 8 levels. Therefore, giving you good control over the direction of your exercise routine. The handlebars on the NS-716R are covered with foam to ensure a firm grip while working out. The handle bars are of standard dimensions, and along with the foam, you can easily keep a firm grip despite the sweat that accompanies when during an intense workout in order for you make the most out of it. The Marcy Recumbent NS-716R bike comes equipped with a LCD screen that accurately tracks your speed, time, distance covered, and time covered with a simple touch of a button. The digital tracking panel also saves your progress to review later on to see how far you’ve come. The digital panel is extremely user friendly and everything is displayed in full view, so you don’t have to strain your eyes. The Marcy NS-716R comes with a magnetic wheel that is equipped with an 8 preset tension adjustment knob that allows you change the level of your workout effortlessly. The knob is extremely easy to turn and doesn’t strain the hand a lot but sturdy enough to change levels for you to continue at lightning fast speed without hindering your workout. Moving round exercise bikes can be a bit of a hassle, as they are big and quite heavy, so shifting it from one room to another can be a bit challenging. The Marcy Magnetic Recumbent Exercise Bike NS-716R comes equipped with convenient transport wheels that allow the bicycle to be moved round without actually lifting it. With the Marcy NS-716R it is all about the comfort of the user, and these transport wheels make them moving around hassle free! The Marcy Magnetic Recumbent Exercise Bike NS-716R is extremely easy to assemble and comes with a step by step guide on how to put the bike together. No prior expertise is needed for the bike to put together. The assembly of the bike hardly takes up to an half an hour or an hour max! One thing that is guaranteed with the Marcy bike is that it is durable; the frame of the bike is of metal and can pull off quite a bit of strain. The metal frame gives the bike some weight that supports the user with extreme ease. The Marcy Magnetic Exercise Bike NS-716R doesn’t take up space despite being a sturdy machine; the dimensions for the bike are 4ft by 26 inches. Therefore it can be easily fitted into your living room or bed room without it occupying too much space. The Marcy Magnetic Recumbent Bike NS-716R is a bargain for anyone who wants to own a comfortable yet effective exercise bike at home. The cost of the bike is only $179.99 and it is the best the money can buy when on a budget. The bike comes equipped with two protection plans, and you may buy any according to your needs. The protection plans covers equipment damage. The two year protection plan costs $19.71 whereas the 3 year protection plan is for $34.48. No slipping and or sliding. The bike is super comfortable and easy to use for anyone with a physical disability, medical or otherwise. The chair is comfortable to sit on for a longer period of time and comes with a back rest that doesn’t strain your back. The pedals on the bike are also adjustable to accommodate your legs and therefore put less pressure on your knees and joints. You can easily watch television or even read a book, while working out on your Marcy Recumbent NS-716R as the reclining position allows you to be a bit freer than a traditional upright exercise bike. The pedals, however are of metal and require proper shoes to be worn in order to avoid any and all injuries while working out. Obesity is a most-talked issue these days, and everyone is looking for a speedy and safe way to get in shape as soon as possible. However, it is also a fact that overnight weight loss regimes are extremely dangerous for health, and can leave regretful results. Therefore, exercises are considered great for this cause. Don’t you agree? Well, the best thing is that, you don’t have to join a gym or look for a running area to properly exercise because a bunch of extraordinary training machines are at your service! Exerpeutic 900XL Recumbent Bike with Pulse is a similar example. This model is designed particularly for those who can’t spare time for a gym session, and need an efficient trainer to workout at the comfort of home. Are you one of them? If so, grab this machine without a second thought. Putting this machine together is as easy as 1-2-3! You don’t have to ask for a helping hand, or lend some special tools for this purpose. This is because the bike comes pre-assembled, for the most part. In addition to this, a user guide is also included within the package to assist you, in case you need further guidance. If you are seeking for a budget bike with maximum comfort rather a trainer full of technology and gadget, then Exerpeutic 900XL Recumbent Bike is just made for you! This model offers you a low-impact workout without straining your joints. The back support and seat base are well-padded. Secondly, its seat is quite wide, and is adjustable so that you can set it at a comfortable position, as per your convenience. This bike entails magnetic resistance, enabling you to select a suitable one out of 8 levels. Therefore, it is equally good for beginners and expert-level fitness enthusiasts. You can switch between these levels with the help of an attached knob and challenge yourself overtime. This feature also facilitates in quiet operations so that users can watch TV or do other stuff while working out without being bothered by annoying paddling noise. 900XL bike comes equipped with the LCD screen that displays all your workout information, including distance covered, calorie burnt, speed, etc. A pulse/heart rate sensor is also there so you can track the statics. By looking at the price, if you are expecting a low-quality bike, then think again! This machine has every feature you can find in a higher-end trainer and that too without breaking your bank. Although, it has an adjustable seat but some users have complaint about its adjustment. This model is easy to assemble. However, if you need any help from the user’s manual, then it will be a disappointment. Beside this, Exerpeutic 900XL bike has sturdy construction, long-lasting durability, quiet operation, top-notch features, adjustable settings and comfortable seat. What else do you need? Get your hands on this trainer and fulfill all your fitness needs in a swift! Exercises play an important role in shaping a bulky body, in case you are looking for a swift weight loss solution. Obesity is a common issue, and mostly people are concerned about their rigid lower-body fat. Are you also suffering? If yes, then Schwinn 270 Recumbent Bike can serve you in the best possible way! Not convinced yet? Well, after reading this review till the end you are surely going to buy this remarkable exercising machine as soon as today! So, keep reading. Before moving ahead, it is your right to know a bit about the manufacturer of this bike. Schwinn is not a new name in the fitness world. Gym owners or fitness enthusiasts must know about this brand because it is a well-known and well-reputed name that has gained a lot of appreciations for producing high-quality machines. Just like other products, this particular model also delivers what it promises! Schwinn 270 bike entails a bunch of phenomenal features that are usually present in higher-end brands with a higher price tag. Don’t believe it? Read on and find out yourself why this bike is a must-have! Putting together this machine is effortless. Although, you have to spare much time for assembling it efficiently because it comes in a lot of pieces, but the task can be done by a single person too. Secondly, an illustration guide is also available within the package that has step-by-step instructions for better understanding. This model flaunts a remarkable console and that too with 29 programmed workouts, which is almost unbelievable at this price range. In fact, you may find a lot of bikes that cost about three times more, but don’t have this much programs. No matter, you are an expert-level fitness freak or jumping into it just now; Schwinn 270 is for everyone. Its settings are customizable so that users can adjust it, according to their stamina and mood. Basically, it’s a best choice for anyone, who is looking for an efficient and budget-friendly bike. This Recumbent Bike enables the riders to download their workout information in order to track performance and to challenge themselves overtime. This feature is rarely present in any other model in its class. 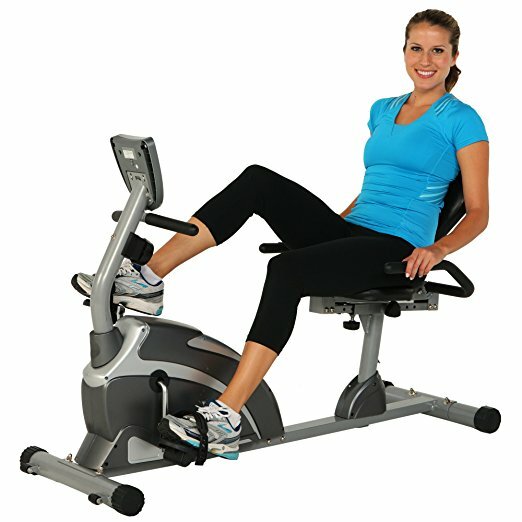 As mentioned above, this exercising machine is produced by a well-known company that has a good reputation for manufacturing high-quality products. 270 trainer bike is also one of its finest models that has a sturdy construction to ensure an increased durability and long life. In addition to this, Schwinn offers 10-year manufacturer warranty on its purchase. Isn’t it great? Usually, low-priced Recumbent bikes flaunt less than 10 resistance levels, but Schwinn 270 is unique. This remarkable machine provides 25 different levels of intensity, which is an amazing feature. This model comes equipped with a high-inertia drive system along with the flywheel which facilitates the user to exercise even on high intensity and high speed without compromising on the performance. 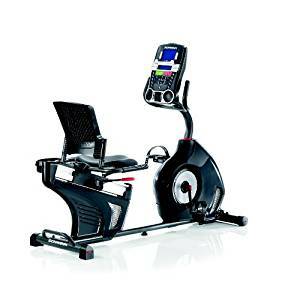 Schwinn 270 is definitely a must-have recumbent bike that can cater to all your fitness needs. It is a great combination of quality, versatility and convenience. There’s hardly any drawback in this model, and its price is super affordable. Apart from built-in workout programs, it also allows you to connect with the internet and download more programs of your choice. You can also listen to music while working out to make your experience more pleasant. What else do you need? Ever thought you could get so many outstanding specs in a single machine? Grab it now! 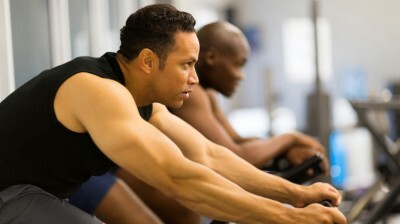 With the increase of fitness craze throughout the world, exercising machines are on hype these days. Why? Because they not only save your time, but also help in shaping your body without any harmful side effects. PROGEAR 555LXT Magnetic Tension Recumbent Bike is one of the finest machines you will find in the market. This model promises to offer maximum convenience to the user so that they can work out without straining their joints. In addition to this, it has a bunch of remarkable features that are bound to gather a lot of appreciations from its consumers. The best thing is that, it is available in a reasonable price, which is affordable for a majority of targeted audiences. 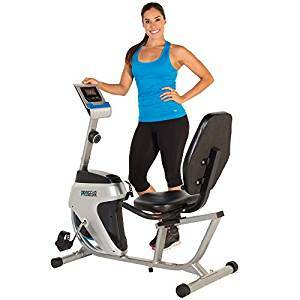 ProGear Fitness is a popular brand that specialized in producing low-priced exercising machine and equipment for an efficient indoor-workout experience. Strengthen your purchasing decision by reading about the features of PROGEAR 555LXT Bike below! The most prominent concern upon buying an exercising equipment is its size, especially when you want a machine to keep indoors. The good news is that, PROGEAR 555LXT Recumbent Bike is ideal for a home-based gym setup because of its space-efficient and compact design, with the dimensions of 49” (L) x 22” (W) x 43” (H). It also allows you to relocate from one room to another, all thanks to the transportation wheels for making this process effortless. This model flaunts a “step thru” design that enables the user to step on and off this bike easily. Moreover, it has a cushioned seat and backrest to offer maximum comfort and to prevent any inconvenience, throughout the session. Cushioned back also offers lower-body support, and overall a pleasant workout experience. 555LXT Recumbent bike has 14 different levels of magnetic tension resistance so that you can select a suitable intensity level, as per your stamina. This feature also provides you an opportunity to challenge yourself overtime. This bike can be used by anyone, who weighs under 250 pounds. Furthermore, its variable resistance level makes this machine well-suited for everyone, whether the rider is beginner or pro, man or woman. 555LXT entails wide pedals that will prevent joint or ankle strain. Secondly, foot straps are also attached to the pedals for locking the feet of rider in place, thus ensuring your safety and security. Apart from all these above-mentioned features, this bike comes equipped with water bottle holder so you don’t have to rush towards the kitchen, while exercising, to keep yourself hydrated. Besides, a smart phone/tablet holder is also attached to the machine. Now you can work or enjoy a movie on your smart phone while shedding some extra kilos. Isn’t it excited? Ever thought you could get this much in a single recumbent bike? Recumbent bikes are higher in demand but at the same time, they are quite expensive as compare to regular equipment. 555LXT is different because it is reasonably priced and affordable for a majority. However, its top-notch features don’t make it less than any higher-end machine. Keeping its low price into the account; 555LXT Recumbent bike has a lot of positive features that are worth your investment in every way. Although, it is not recommended to the extremely tall and extremely short individuals, but this bike is a must-have for the rest. It works best for beginners as well as experts because of variable resistance levels. All in all, 555LXT is designed for those who are looking for a light and compact workout equipment in a reasonable price. Are you one of them? Buy it to try it! Are you tired of running to the gym everyday? Is it hard for you to follow a bland diet at home? Are you looking for an easy way to shed those extra kilos? Well, don’t fret and sweat because here is a great news for you! Velocity Exercise CHB-R2101 Recumbent Exercise Bike promises to solve all your weight-loss problems and that too without breaking your bank! This model is designed particularly for your home-based gym, all thanks to its space-efficient structure and top-notch features, that allow the user to exercise at any time of the day. Do you wish to know more about this remarkable product? If so, then keep reading and have a look at the attractive features of CHB-R2101 Recumbent Bike below, and find out why this equipment is a must-have. The bike is well-made. Its sturdy frame stay firm instead of wobbling, as you engage yourself in an intense workout. It also has a powder coat finish, which enhances durability and increases product longevity. Furthermore, the equipment can be adjusted to suit a range of heights, between 5ft to 6ft 3inches, simply through a knob present at the bottom of the bike, thus making it an ideal choice for different individuals. This recumbent bike flaunts a two way flywheel that facilitates a smooth ride. In addition, it is also equipped with padded foot pedals and adjustable straps. This means that you can pedal away to strengthen several leg muscles without straining your feet. Secondly, it allows you to strap up nicely to prevent foot slippage while you enjoy the eight levels of preset resistance. Handlebars are also there to provide users with a comfortable grip. Basically, this model is an excellent blend of quality and convenience. Wouldn’t it be great if you could track your progress as you sweat away those extra kilos? Well, you have been heard! This Velocity exercise bike provides you with a large console display that tracks time, speed, distance and calories burnt. It even monitors your heart rate through the hand pulse sensors as you pedal with sheer determination on this super-quiet machine. The equipment comes with an instruction manual to help you while setting it up, so the assembly is quite simple and doesn’t require any professional help. Besides, after you have set it up, you can also move it from one place to another as the exercise machine has built in transport wheels that allow easy mobility as well as storage. CHB-R2101 Recumbent Exercise Bike can be your best workout partner because it entails everything that you must be searching for! The great thing is that, it will not cost you an arm and a leg. From effortless assembly to sturdy body and quality features to best price; this model is designed to offer you maximum convenience to make your workout experience pleasant and enjoyable. Moreover, it is well-suited for everyone, be it an expert or a beginner because of a variety of resistance levels provided by this equipment. So, what are you waiting for? Get your hands on this phenomenal recumbent bike and pedal away all your extra body fat. Are you thinking of reducing extra kilos? Do you get tired of hearing about protein shakes and steroids that trigger weight loss? Does consuming supplements make you gag? If the answer to all these questions is yes, then the Schwinn 230 Recumbent Bike is just made for you! Curious to know how? Find out below. 230 Recumbent bike by Schwinn is highly appreciated widely because of its space-saving design, top-notch features and quality performance. It possesses all those qualities that you might be searching for in a perfect exercising equipment. Have a detailed look at the features of this remarkable exercising machine and strengthen your purchasing decision. The exercise machine comes equipped with 20 fitness programs, enabling the users to choose a suitable one, as per their stamina and ability. Thus, this model is ideal for beginners as well as experts. Plus, it is equally suitable for both, men and women. Like every recumbent exercise bike; Schwinn 230 is pretty easy to access. It has a “step thru” design, which makes it effortless for you to step on and off the bike. This bike allows tracking of workout information. In addition to this, a USB connectivity option is also there for storing data. Moreover, you can connect it with MyFitnessPal app and download additional workout programs, if required. Although the bike is not so heavy, but still it has a well-balanced and durable structure. It only weighs 82 pounds, and has the ability to withstand 300 pounds weight, which is pretty cool for a less-expensive recumbent bike. Having two user profiles on a single recumbent bike is not something we see everyday. This features allow each rider to save their own workout information, personal data and customize programs of their choice. Now you and your workout partner can share a single equipment and challenge each other. Whether you have a medium to small height, or you are taller than average; this model is made for everyone. It has a comfortable seat that can be adjusted according to the height of user in order to offer maximum convenience. How great is that? The 230 recumbent bike entails 20 resistance levels so you can challenge yourself overtime, whenever you wish to! You can easily navigate through the bike’s console for listening to your favorite songs as you pedal away, by connecting your MP3 player with it. So, no boring workout from now on! Apart from this, the Schwinn 230 Recumbent Bike features a three-speed fan, media tray, a bottle holder and a USB charging port as well. Schwinn 230 Recumbent Bike is light in weight, sturdy in construction, excellent in performance, quiet in operation and above all, affordable in price. Moreover, it does not consume much space within your home or office, all thanks to its space-saving design. Basically, this model is a great blend of convenience, quality and versatility. Although, it is not good at tracking pulse rate, but that not something which can overshadow the positive aspects of this phenomenal bike. Isn’t it? So, when are you getting your hands on Schwinn 230? Buy it today and enjoy working out with maximum ease and convenience! No doubt bicycling is an effective way of exercising, but there are many added benefits when one uses a recumbent exercise bike that go beyond just getting in shape. 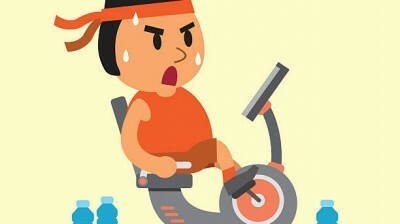 One of the benefits of a recumbent exercise bike is that it helps keep your heart and joints healthy. As using on helps you alleviate back pain that usually is accompanied with riding a bike. Recumbent bikes come in helpful for people with arthritis and old people who have weak joints. Also as a recumbent bike is in a reclining position, your legs are at the same height as your heart that promotes return blood flow to the heart and improves circulation. Also when it comes to speed, they are much faster than upright bikes due to the design and seating the recumbent bike is more aerodynamic. The wind resistance is reduced by 15-30% with a recumbent bike, but it depends on the type as well. With recumbent exercise bikes being closer to the ground, they have a lower center of gravity and reduce the risks of falling off of one. 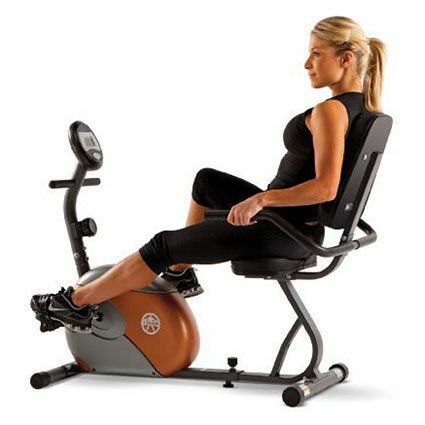 Of course, recumbent exercise bikes are the most comfortable exercise bikes due to their reclined position that doesn’t stress not only your back but neck and arms as well. It is easy to ride as the paddles are near the front rather than near the seat. Like any other workout, it is extremely important that one must wear the right kind of shoes when using a recumbent exercise machine. The shoes ideally should be closed one, as the gears on the recumbent bikes move fast and one can get hurt. Also the right clothes, do not wear loose fitting ones that may get stuck in the gears. Keep the moisture of the machine. When working out keep a towel handy to wipe the machine when done, as you are bound to sweat a lot. A recumbent exercise bike can take a lot, but it is important to maintain it in order to keep the machine in better shape for a longer period of time.